On September 11th, 2001, something happened, but I don’t quite remember what it was. For a little while the TV showed me some pictures… And then… I didn’t see them anymore, so I forgot them. If I concentrate really hard I seem to remember people jumping from burning buildings. The images were too disturbing. I was told they were “divisive.” What if I kept seeing them? I would become enraged and take it out on an oppressed ethnic group. I might question the value of our unique multicultural society, the one that tolerates and respects diversity. So I didn’t see the images anymore… and I forgot. There were images that were appropriate for ordinary people like me, so I was shown them instead. Pictures of hooded men standing with wires attached to them, of leashed naked men being taunted. There were photos of men with women’s underwear on their heads. Terrible things were being done to these men; their religion was disrespected and they were kept up past their bedtimes. Sometimes they had to listen to loud pop music. Terrible, terrible things were done, and I saw those images over and over again until they were seared — seared — in my memory. I forgot the other images. The images of Americans suffering and dying for no reason: I forgot them. The images of brave firemen and policemen entering burning buildings to face certain death: I forgot them. The valiant soldiers who fought on my behalf to prevent more innocent people from being killed: I forgot them. Oh, I do remember a bad man reading about a pet goat while people suffered, a bad man who sent psychopaths to kill kite-flying children in a faraway country of which I know little*. I remember that image well. But I can’t seem to recall a planeload of ordinary Americans who decided to fight back, knowing by then that they were going to die. Nor do I remember their microscopic fragments scattered across the green fields of Pennsylvania. When I try to remember that beautiful fall day and those frightened children and their mothers in a jetliner rushing towards the side of a skyscraper… I just can’t. Please help me remember. Should I tie a string around my finger? Write a note to myself? Help me not to forget. UPDATE: Here are some excellent 9-11 memorials worth a look, by Michelle Malkin, Bill Quick, and CUANAS (multiple posts with photos; start at the top and keep scrolling). This is the best 9/11 memorial I've seen. I've watched it over a dozen times, and every time I need to remind myself why things have to be different after September 11, 2001, than they were before that date, I simply watch it again. People of the Anglosphere do not react to this type of provocation passively. Not if they are the least bit intelligent. It is sad that much of the academic, journalistic, and entertainment classes are not intelligent in any meaningful sense of the word. al fin -- I agree; that is definitely the best memorial. I'm glad you reminded me. Very well put. From about two weeks after 9/11, there seems to have been a decision taken by the MSM, that images of 9/11 were not good for us. We are children and must be protected from the bad world outside. So we were given sedatives, all to take the pain of 9/11 go away. Bear in mind though, they are doing this for our good. A good man, all happy and smiley walking through a garden arm in arm with the King. A good man who is doing everything to protect us from stuff that happens, y'know the terrorists and stuff. Flypaper save us all. But NOW, they think the HAVE to show the dead, bloated bodies of those killed in Nawlins, caused by Gov. Blaco's and Mayor Nagin's incompetence.. Dont think it is becuase they STILL think its Bush's fault do you?? Every time I see that 9/11 cerulean blue sky over the D.C. area, I relive that day. The sky today was almost that same color. The media can do as they do, but I will never forget. And I won't be quiet about it either. The conspiracy of silence can't work as long as enough of us refuse to become co-conspirators. Wild Bill -- it's OK to show dead bodies as long as they are the fault of Republicans. In fact, it's mandatory to show them under those circumstances. This is the worst 9/11 memorial (design) that I've seen. The winning design, announced Wednesday in Washington, D.C., includes what is called the "Crescent of Embrace." That element of the project calls for two rows of red maple trees to be planted around a bowl-shaped piece of land adjacent to the crash site. The trees, according to the architects, are there to create a physical edge to the landscape and accentuate the topography. It's hard for me to believe that the relatives of the passengers on Flight 93 don't have a problem with this. In my opinion to use a red crescent as the central feature of the design is a slap in the face to passengers of Flight 93 including Todd Beamer and the others who broke into the cabin and thwarted the intent of the hijackers to crash the plane into the White House or Capitol Building. This is an abomination. I will make my feelings known to the National Park Service and hope others will do the same. On 9/11 I got up a little late, took a shower, got dressed and rushed out to my car to contend with the morning traffic jam. 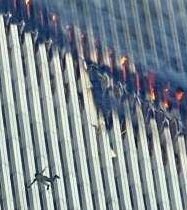 About five minutes into my drive, I turned on the Howard Stern Show and heard him ranting (in a voice tinged with both anger and fear) about how both WTC towers had been hit with planes, as well as the Pentagon - and that an unknown quantity of planes were still missing. I drove back home and got back in time to watch the towers fall. As I was watching, my two-year old daughter was crying for me to put on a Little Mermaid video. The pathos sent me into helpless tears. I thought to myself, "What kind of life have I brought my daughter into? We were wrong to have children? This world is too horrible." But almost as immediately as the tears started, another idea came into my head which changed my life. (Understand, I was a Chomsky-reading liberal Christian at the time, so this new idea was a shock to me.) Suddenly, the Christian side kicked in, and it occurred to me that I did not bring my daughter into the world to watch Little Mermaid videos. I brought her into the world to be good, and to make the world a better place. And, in realizing that, I also realized that it was my duty as well. I said to my wife, "This is war. Things are not going to be the same. Everything is going to change. This is worse than Pearl Harbor." My wife is a first-generation immigrant from a third-world country. Her response to me was, "If they destroy America my people will have no hope. We dream all our lives of being able to come to America. We wouldn't have that dream anymore." I thought about how my mother had told me that during WWII the whole nation had mobilized for war. She worked in a munitions factory, and my father served in Italy and Morrocco. I fully believed that we would do this again in response to the WTC attacks. I thought, "What can I do to help? What can I do? I can write." In my heart that day, I decided to write pro-American "propaganda" in the Frank Capra tradition. In other words, propaganda which inspires not through lies, but by reminding us of who we are fighting against, and what it is we are fighting for. And that's what I have been doing since. I truly hope I help in some way. I'm very glad you two are doing what you are doing.